Thank you to everyone that has expressed an interest in getting a calendar for next year or CDs of all photos for them during this year. CDs cost £40 (fixed since 2010) and contain all images of you during 2013. I think that is a fair price for drivers that I have captured at a few events and is a bargain for those whose path I have crossed more frequently. Single images can be brought for £6 each, delivered by email. Please use the checkout option in the gallery to order photos in that way. If you have already purchased images from this year (thank you!) and would like a full CD, please order the CD as normal and I will then issue a refund to match what you have already spent (excluding the postage costs if applicable). Just to be clear, that means your total cost for photos will be £40. When ordering please make a note on the Paypal page under 'special instructions to the seller' to say what you have purchased before so I don't miss it. 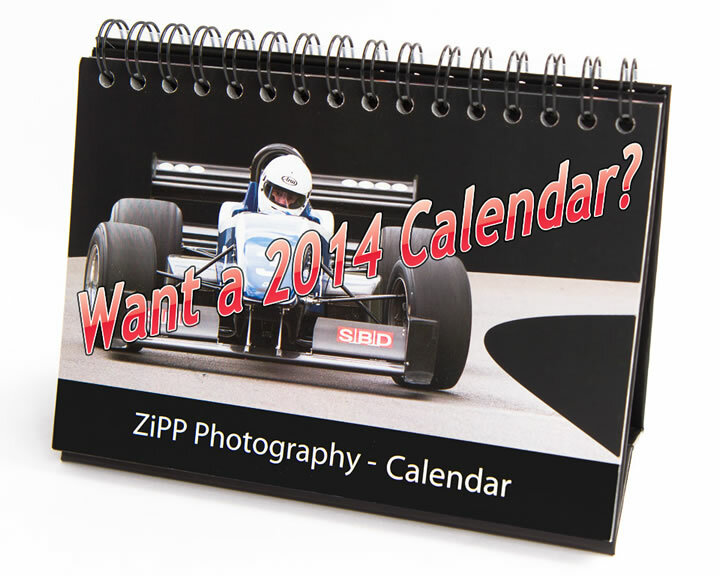 I have now virtually sold out of 2014 Calendars so I have taken the online ordering option down. If you would like one then please get in touch and I will let you know if there are any available or if there is a chance of ordering more. If you have any questions please use the contact form and I'll get back to you as soon as I can. The reason I have a table on this site is because, before BARC took over the championship, there wasn't a reliably updated public table available and, since I wanted to see how things stood, decided it was worth setting one up here for people to use. Over time it has got gradually more automated to the point where I can normally get it updated before the cars have returned back down the hill - subject to phone signal, battery life and the screen not filling with water as it did once this year! Now that there is a table on the official championship site this one isn't needed as much but it doesn't take much effort to keep it updated so it will probably stick around for a bit. So, why are the tables sometimes different and which one is wrong? Well neither is wrong, it is just down to a difference in the way dropped scores are included in the total. The way other people work is they focus on the total points scored until they get to the final 6 rounds where they take off the lowest scores one at a time. This makes it simple to calculate but means that for 28 of the 34 rounds you are looking at total points scored when the championship is decided with 6 dropped scores. The way I work is I always drop the 6 lowest scores which I think makes for a more useful figure. This does mean that on my table everyone has 0 points for the first 6 rounds but that isn't really a problem as my table also takes into account the tie break rules, which includes counting dropped scores, so as it can still put the drivers in order. To try to prove, to myself as much as anyone, that my method was more informative I decided to look at the data for some of the closest battles of the season, Scott vs Trevor, Alex vs Roger & Will Vs John plus Scott Vs John chosen at random. Below you will see a graph that shows the points difference between the two drivers after each round as shown by my table (green line) and the official tables (blue line). Use the drop down box to select a different battle. Starting with the Scott Vs Trevor graph you will notice both methods agree on the final outcome, Scott winning by 12 points, but the way they got there are quite different with the most significant point being after round 22 when, just looking at totals, Trevor was 5 pts ahead but, taking into account dropped scores, Scott was 8 pts ahead. Taking the dropped scores out early has the effect of smoothing the graph, in the same way the dropped scores are, partly, there to help smooth out the effect of missed rounds. The Alex Vs Roger graph shows at round 32 a difference of Alex 2 pts ahead using my method but 3pts behind using the other way. Alex had a late surge to pass Roger and claim number 4. By taking into account dropped scores my table showed Alex passing him before the other table. Will Vs John is a bit less clear, and on first sight seems to have the standard method of leaving dropped scores till the end predicting the end result sooner, but it doesn't show how close it was around round 28. At that point it was much closer than the 5 pts the standard table shows. Scott Vs John was thrown in just to see how a non-close battle would look but it does show some interesting points. There are a few rounds where John outscored Scott (3, 14, 21 & 22) and looking at the standard blue line it would appear that the gap between the drivers was reducing. What actually happened is Scott picked up a low score that he could then include in has drops and so include a larger score that he would have otherwise dropped. This means that in those rounds John actually drifted further behind and the green line shows that. So this is just a post to explain why there may appear to be some differences between the tables and why I have decided to handle the dropped scores the way I have. The are good reasons for doing it the other way, mostly that it is much easier to calculate, but I feel the way I work it out shows a clearer picture of the state of play. Let me know if you have any thought or questions. I may add these graphs to be updated live next year. After Prescott, and despite only being 6 points ahead of Trevor Willis on total score, Scott Moran has taken a commanding lead in the championship due to Trevor now starting to have scores to drop. A 5th place or higher in any of the remaining 4 rounds will secure the title for Scott. For every point less than 44 (4 * records) that Trevor scores Scott can finish a place lower and still claim the title. E.g. if Trevor finishes 2nd in a runoff, so reducing his possible total by 2 points, Scott then only needs one finish of 7th or above. This means the title is very likely to be decided at Doune this year. Wallace Menzies failed to secure number 3 at Prescott but should do that at Doune. Roger Moran is the only person that can catch him but would need to get at least two hill records to close the gap. Alex Summers, is still currently in 5th, but has closed the gap to Roger Moran down to 5 points after dropped scores. Roger needs to score at least 13 points more than Alex at Doune to secure the number 4, otherwise that battle will be decided at Loton. Will Hall (6th) extended his lead over John Bradburn (7th) to 6 points after Prescott. Will needs to score 9 points more than John at Doune to secure his place - an 8 point difference will do if Will fails to score in one round. Jos Goodyear looks to be safe in 8th, though he has a chance of moving up or down. He would need to score 8 points more than John at Doune to keep a chance of getting 7th and Tom would have to score 6 points more, or Deryk 7 points more, than him to keep an option of getting 8th. Tom New passed Deryk Young to move into 9th at Prescott. The two are now separated by a single point in the fight to get the last single digit number. Below 10th there are a number of drivers that could still make it in and claim a number for next year but I expect Tom and Deryk to score at a rate that keeps them at bay. with the 4/5, 6/7 & 9/10 battles being left to be decided at Loton Park. In other news, quite a few people are starting to ask about CD's and calendars again. I currently have a huge backlog of images to sort out but will be doing CDs later in the year and will do calendars if I can get a good price on getting them printed. The company I have used in the past produce a great product but their standard price is almost £20 each, before any markup, and I don't think they are worth that much. I will post an update here when I find out more. Two more driver's tried out my video glasses at a recent meeting at Loton Park. Debbie Dunbar tried them in her Westfield and Alex Summers in his DJ Firehawk. Video's from both driver are below. Congratulations to Scott Moran who won his 100th MSA British Hillclimb Championship round at Gurston Down over the weekend.